Rotation,Oscillation There are 19 products. This variable-speed motor rotates up to 3,500 rpm. A central chuck with wing-nut supports various demonstration equipment, such as a color wheel (not included). The digital display shows RPM or Hertz. Uses 115 VAC 60 Hz. Suggested use: Spin a Color Wheel (P/N 614-0240) and use our Digital Stroboscope (P/N 50-005) to "Stop the Motion" of the wheel. 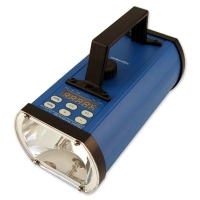 The 5-digit LED digital readout on this economical stroboscope gives the exact number of flashes per second. 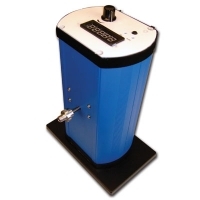 Charge it and take it anywhere you want to clock rotational velocities. Try it with a spinning fan. 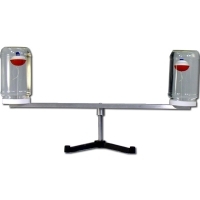 Features include: Xenon flashlamp Solid state design Three modes: RPM, Hz and mSec. Can use internal or external signal source. Can be fine-tuned. 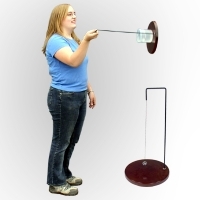 This PSSC-designed kit can be used to show the effect of mass, radius and velocity on the centripetal force of a rotating body. The experiment uses the weight of one to 20 1g masses from one end of a cord as a counterweight to the pull of a rubber weight swinging in a circle overhead. 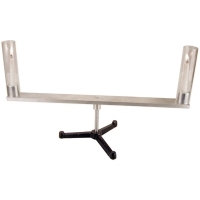 Includes handle, sturdy cord, rubber weight, masses (20) and instructions. Centripetal Force Paradox. (Fish Bobber Acceleration). 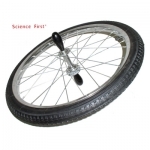 A great way to understand centripetal force and centrifugal force. Why do the flames turn in instead of out when spun on the rotator?